Help spread the word and share your Soup Sisters Story! Select the Soup Sisters location nearest you to participate! Most importantly, Soup Sisters and Broth Brothers will experience the gratification that comes from gathering together with other community members to help women, children and youth in crisis. 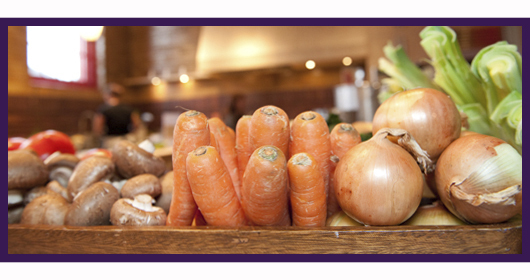 Every soup-making event will provide many litres of comforting and healing nourishment for our recipients. Soup Sisters and Broth Brothers will enjoy the delicious fruits of their labor by being served a Light Soup Supper following their soup-making. All groups will have the privilege of being taught and supervised by an experienced Chef or professional cook at each soup-making event. Experience the pleasure of working in a state-of-the-art professional kitchen with high quality tools and equipment. The finest and freshest ingredients will be provided for soup-making, expertly selected and conveniently supplied by our commercial kitchen partners. Our monthly events operate at a break even in order to remain accessible to everyone. As we meet the demands to provide home made soup across the country our rapid growth requires donations. Your contribution is a valuable investment in our communities that generates tangible action through real results. Please go to our Soup Support page to find out all of the simple ways in which you can donate. Soup Sisters is a registered not-for-profit organization and donations over $25 are eligible for a tax-deductible receipt. Le sentiment de satisfaction que vous ressentez lorsque vous faites partie d'un groupe de gens r�unis pour aider les femmes, les enfants et les adolescents en difficult� constitue le principal attrait de votre participation. Chaque soir�e vous donnera la chance de pr�parer des litres d'espoir et de r�confort liquides pour nos b�n�ficiaires. Le volet culinaire de chaque soir�e sera dirig� par un chef professionnel qui vous guidera lors de la pr�paration de la soupe. D�couvrez le plaisir de travailler dans une cuisine professionnelle dot�e des meilleurs outils et pi�ces d'�quipement. Nos partenaires de restauration se chargeront de choisir des ingr�dients frais de la plus haute qualit� pour la soupe. Nous nous assurons que chaque soir�e s'autofinance afin qu'elle soit accessible au plus grand nombre de participants. Nous comptons sur vos dons pour appuyer l'expansion de nos activit�s dans toutes les communaut�s canadiennes qui pourraient en b�n�ficier. Votre contribution repr�sente un investissement direct dans le bien-�tre de votre communaut� par des actions concr�tes qui g�n�rent des r�sultats tangibles. Veuillez consulter la section dons et contributions de notre site pour en savoir comment vous pouvez contribuer facilement � nos efforts. Soup Sisters est enregistr� comme organisme sans but lucratif et autoris� � d�livrer un re�u aux fins de l'imp�t pour les dons d�passant 25 $ qu'il re�oit. *10 % des frais d'inscription seront vers�s � Soup Sisters sous forme de don de charit�. Soup Sisters is an innovative social marketing and community building program that is 100% volunteer driven and creates opportunity to dialogue with thousands of new people to raise awareness about family violence. Groups across the country have been able to transform their contributions into a meaningful experience and a tangible way to give at our soup making events. Soup Sisters and Broth Brothers is operating over 30 events in 25 cities across Canada and the US every month. Hundreds of community people are coming together across the country each month to produce over 10,000 servings of home-made, nurturing and nourishing soups for women, children and youth in crisis. 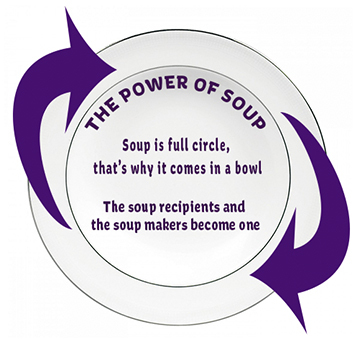 Since March 2009, Soup Sisters has provided over 1.5 million servings of soup to more than 40 shelter recipients and there is a growing network of over 50,000 Soup Sisters and Broth Brothers participants nationwide. Soup Sisters and Broth Brothers is a registered not-for-profit organization and donations are eligible for a tax-deductible receipt. Charitable Business Number: 82827 6915 RR 0001.